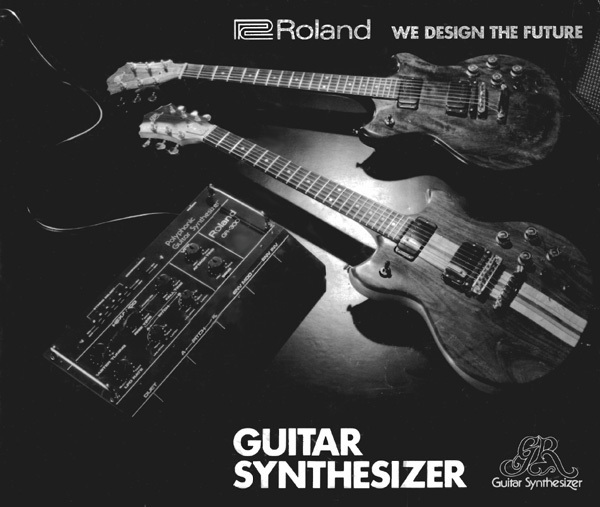 Roland invented the first true guitar synthesizer. Now, we've made it obsolete. Today, the GR system is still considered the Rolls Royce of guitar synthesizers by top musicians all over the world. But now Roland introduces a guitar synthesizer which is as far advanced over the GR system as the GR was over previous designs. This new model has not only a synthesizer, but also an expanded guitar section which lets the guitar realize its full potential. A new pickup layout, with two humbucking pickups and a specially designed (divided humbucking) pickup is used. Which makes it a top ranking guitar if judged by guitar standards alone. There are two special guitar units available: a through neck G-808 and an attached neck G-303. The G-808 and G-303 are both professional level guitars. 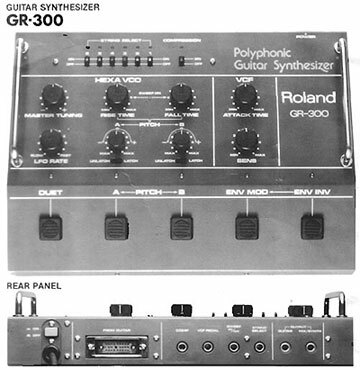 So if you want to buy a guitar which can later be coupled to the GR-300 synthesizer, they represent the most logical investment. The GR-300 is a polyphonic synthesizer with a Hexa-VCO (one VCO for each string) That's why it's easy to play string chords and bass sounds. The GR-300 is controlled by foot switches with electronic switching. At the same time, frequently used controls such as those for cutoff frequency, resonance, and vibrato are located on the guitar side. This represents a great advance in controllability at concerts and other live performances. Everything about the GR-300 is dramatically new and different. From its convenient touch switch for control of vibrato to its sophisticated synthesizer circuitry. it's designed to bring out your full expression. Plus, you can experiment with guitar techniques that are impossible with any other unit. Hammering, harmonics, chopping, glissando, and muting are all possible. In short, the GR-300 gives guitarists the best of both the guitar and the synthesizer. The G-303 and G-808 Guitar Controllers are tuned and played in exactly the same manner as an ordinary electric guitar. When storing the Guitar Controller in its case, leave the strings tightened as when playing. The G-303 and G-808 Guitar Controllers cannot be used with the GR-500. (To protect the 24-pin connector, leave its rubber cover in place). Use the PICKUP SELECTOR switch to select the desired pickup. Use the MASTER VOLUME and TONE controls to control the guitar volume and tone. The NORMAL OUTPUT jack may also be used when using the G-300 Guitar Synthesizer. The MASTER VOLUME and TONE controls will work as above, but the BALANCE control will have no effect on the NORMAL OUTPUT sound. After connecting the Guitar Controller to the Guitar Synthesizer, and after connecting the Guitar Synthesizer output to an amplifier turn on the power switch. The MASTER VOLUME control controls the overall sound level from the guitar and synthesizer. The TONE control controls the tone of the guitar sound. The BALANCE control is used to set the balance between the guitar sound and the synthesizer sound. Turn counterclockwise to increase the guitar sound and clockwise to increase the synthesizer sound. Somewhere in between, both sounds will be equal in volume. The exact balance point will change and depends on the VCF CUTOFF FREQ control setting. The VCF CUTOFF FREQ and RESONANCE controls are the two synthesizer VCF (voltage controlled filter) controls. The CUTOFF FREQ control controls the cutoff point of the VCF, the cutoff point determining the tone color of the synthesizer sound. High produces a hard sound; low produces a soft sound. The RESONANCE control is used to accent the frequencies at the cutoff point of the VCF to add strong coloration to the tone color of the sound. A vibrato effect can be added to the synthesizer VCO’s (voltage controlled oscillators). The ON/OFF function of the vibrato is controlled by the touch plates located on each side of the humbucking pickup nearest the bridge. One touch of the upper touch plate will turn the continuous vibrato effect ON. The lower touch plate is used for onetouch vibrato: vibrato will be produced only as long as the plate is touched. It is also used for stopping the continuous vibrato effect started with the upper touch plate. Since touching the lower plate produces vibrato, the continuous vibrato will end when the lower plate is released. The operation of the touch plates depends on using the body of the player to form a bridge between the plate and electrical ground. When stopping strings with the left hand, there is no problem because the left hand fingers are touching the strings which are metal and at ground potential. With vibrato effects on open strings, it may become necessary for the player to form a bridge to ground. This can be done by touching bare skin to any metal part of the Guitar Controller (or Guitar Synthesizer) while simultaneously touching the plate. For example, the right hand could touch the plate and the bridge or strings, or the left hand could touch an unused string or any part of the tuning mechanism. The vibrato ON/OFF function is controlled as above, and the depth of the effect is controlled by the VIB DEPTH control. The VOICE SELECTOR switch determines the sound source used for synthesizing sounds. With the switch up, the source of voicing is the six synthesizer VCO’s and the fundamental pitch extracted from the guitar string sounds. With the switch down, the voicing comes from the six distortion circuits. At center, the source is a combination of the two above positions. To produce the synthesizer sound, turn the balance control fully clockwise. This control determines the balance between the guitar and synthesizer sounds. The DUET switch adds the fundamental pitches of the guitar strings to the VCO sounds to produces a chorus effect. It is necessary to tune the VCO’s so that they match the pitches of the strings by using the MASTER TUNING control. For accurate tuning, use as high a guitar pitch as possible and allow at least ten minutes for a warm-up period after first turning on the power switch. The two controls, CUTOFF FREQ and RESONANCE combine to control the tone color of the sound passing through the VCF. The ENV MOD (envelope modulation) foot switch turns the "wow" effect on and off. The SENS (sensitivity) knob controls the depth of the "wow" effect. The ATTACK TIME knob controls the time required for the rising part of the "wow" sound. The CUTOFF FREQ knob controls the tone color of the sound manually and is used to set the initial tone color value. When the ENV MOD Mode is used, the tone color is swept up, then back down to the initial tone color. If the CUTOFF FREQ knob is at "10", the initial tone color will be bright, but since the tone color control is already at maximum, the ENV MOD mode will have no effect on the tone color. If a foot volume pedal (Roland FV-2; sold separately) is connected to the VCF RED jack on the rear panel of the Guitar Synthesizer, the cutoff frequency of the VCF (in other words, the tone color of the output sound) can be controlled manually with your foot. The COMPRESSION made is most often used when synthesizing such sounds as brass and string sounds. A foot switch (Roland FS-1; sold separately) can be used with the COMP jack on the rear panel for turning the COMPRESSION mode on and off. If a foot switch is used, the front panel COMPRESSION switch is disabled. Vibrato can be produced in the normal guitar way by using the finger to vary the tension on the string, or it can be produced electronically for a wide number of effects. The electronic vibrato affects only the VCO’s in the DUET mode, the combination of the non-vibrato fundamental string pitches with the vibrato VCO pitches produces the chorus effect sound. 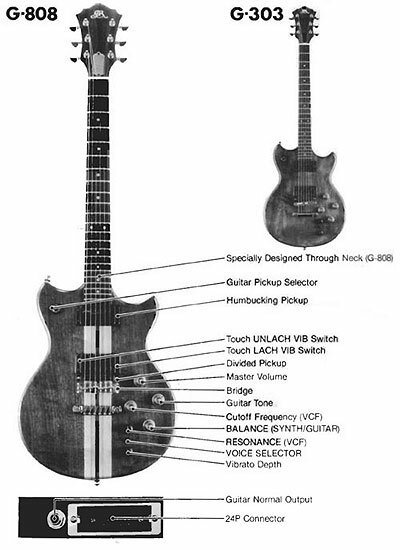 The Guitar Controller Instruction Manual contains additional information on the vibrato ON/OFF function. Another VCO effect is pitch shift, an effect where the VCO’s can be shifted to pitches other than the string pitches. In the DUET mode, the fundamental pitches will be the same as the string pitches, and the VCO’s can be tuned to other pitches so that one instrument produces the effect of a very large group. When using the guitar and synthesizer sounds simultaneously (Guitar Controller BALANCE control somewhere near center), the STRING SELECT switches can be used to determine which strings are to produce the synthesizer sounds. There are six switches, one for each string. Only those switches that are ON will produce synthesizer sounds. These switches can be used where it is desired to play a melody or a bass line against guitar chords. For example, or for other effects where the synthesizer notes are to be relatively independent of the guitar notes. There is one more switch on the Guitar Controller left to be explained. With this switch at the VCO position (pointing towards the bridge), the VCO synthesizer sound is produced. When changed to point in the opposite direction, the HEXA-DISTORTION effect is produced. At center, both synthesizer and distortion sounds are produced. The GR-300 distortion is different from ordinary guitar distortion in that there is a separate distortion circuits for each of the six guitar strings thus producing an unusually clear distortion effect even when chords are played. This sound is also passed through the VCF where the tone color can be further processed. Try the VCO + DISTORTION sound. Thanks to Richard Hilleman who sent me the scans of his original brochure! !